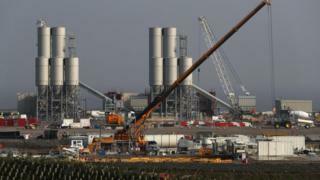 Strike action has been averted as hundreds of workers building the new nuclear power station at Hinkley Point voted for an improved pay deal. Unions Unite and GMB were preparing for industrial action at the Somerset site after an ongoing pay dispute with EDF. Phil Whitehurst, from the GMB, said the dispute could have had “devastating consequences”. EDF and main contractor BYLOR proposed a revised offer incorporating bonuses into the basic rate. Wages will be 36% above the minimum industry-agreed rate and holiday pay, overtime rates and pension contributions will also increase. He described their reward package as “best in class” and affordable, offering all workers “an opportunity to personally grow and develop”. The pay rates agreed would provide a significant boost to the local economy, he added. GMB National Secretary Phil Whitehurst said he hoped “an open and transparent relationship” would result from the agreement. In June the National Audit Office labelled the project to build the new Hinkley Point C power station as “risky and expensive”. EDF announced in July its total cost was likely to rise by £1.5bn to £19.6bn and could be delayed by up to 15 months.